Olivia tells us how her creative thinking training has helped her in the workplace. I’m Olivia, you may have read my other blog ‘The graduate: a day in the life’. I was lucky enough to attend two of Edward de Bono’s most popular techniques Edward de Bono’s Six Thinking Hats® and Lateral Thinking™. This blog is to tell you how I’ve used, and benefited from, the techniques I learnt. The workshops I attended were over three days. Initially, I thought this was a lot of time to take out of the office. I was told the two workshops enable anyone in business, not just graduates, to maximise their creative thinking and idea generation. I thought that, having spent four years at university, I’d already know this! As a marketing executive, running art exhibitions to attract clients, it is my job to invent creative ways of attracting clients. On a daily basis I’m required to come up with new and exciting artists and themes. The gallery will then invest marketing budget to feature artists, who will then act as brand ambassadors, vouching for our credibility as a company. Being the self-deprecating type, I have the tendency, as many of us do, to run around in circles when coming up with ideas. When I think of something new which initially seems great, I inevitably end up cancelling out that very same idea with the reasons why it would not work. Before my idea has even learnt to walk I’ve kicked it over and taken its shoes! My university experience had taught me how to separate different modes of thinking. I was used to being fairly critical and so I was using my black hat too often. My ideas deserved the time to develop. Generating ideas – To start with I select the most useful Lateral Thinking™ techniques to generate ideas. Resulting in an impressive number of event themes, which evolved into names and personalities for exhibitions. 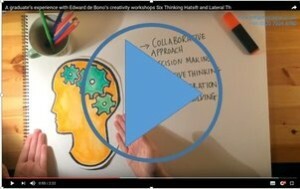 Saving time, increasing my productivity – Then I’d move onto the Six Thinking Hats®. Personally, I think this technique is the most valuable for saving time and increasing productivity. Like most of you, I was working to very tight deadlines and didn’t have time to spare on faffing. The Blue Hat, which manages the thinking and the way you use the other hats, was my stand-out tool. I used it to keep myself in check, as a way of managing my time and to keep my ‘thinking’ sessions short and productive. The situation – One evening, about an hour and a half before the opening of a private view I realised that I needed a lighting installation on a shelf in the gallery. The challenge – I needed ideas fast! I needed it to be invisible (electric lighting without the electricity) – no wires or plugs. So, a light installation was, after much confusion and difficulty, installed on the shelf. It was not ‘invisible’. Refocus – The wire was black, looking terrible against the bright white of our walls. I initially identified my focus as ‘the wire is black, it should be white. I need to channel the wall, replaster and paint’. Will it work? – I didn’t have the time or expertise. I cannot channel out a wall, let alone plaster. The three coats of paint needed wouldn’t dry in time to secure the wire neatly against the wall or to cover the black wire. Redefined refocus – ‘The wire needs to be hidden and fastened to the wall’. The final solution – Masking tape and paint. I used white masking tape, seamlessly securing the wire down. It only needed one lick of paint to make it almost unnoticeable. It dried in time and no-one noticed. Calmly deliver solutions to the types of problems that arise. Generate lots of ideas and effectively analyse them. Feel more confident in what I’m doing. I’m making a positive influence and am more effective in my job. Just imagine what creative thinking could do for you or your graduates! This entry was posted in Creative Thinking, Edward de Bono, Graduates and tagged Complex Problem-Solving, Creative Thinking, Graduates, Lateral Thinking, Problem-Solving, Six Thinking Hats by Olivia Prendergast. Bookmark the permalink.